Masonry over the windows and doors of your building is supported by steel sections, know as lintels. They are fastened above a building’s windows and doors to act as a shelf for masonry. Lintels, like bricks, are extremely durable, but not indestructible. Factors like cracks in the outer masonry, humidity, heavy rainfall and the freezing and thawing of cold winters wear down these steel shelves and surrounding brick, allowing moisture to seep inside and corrode the lintels. How can I if there’s deterioration? This deterioration occurs in the form of severe oxidation, or rust corrosion. 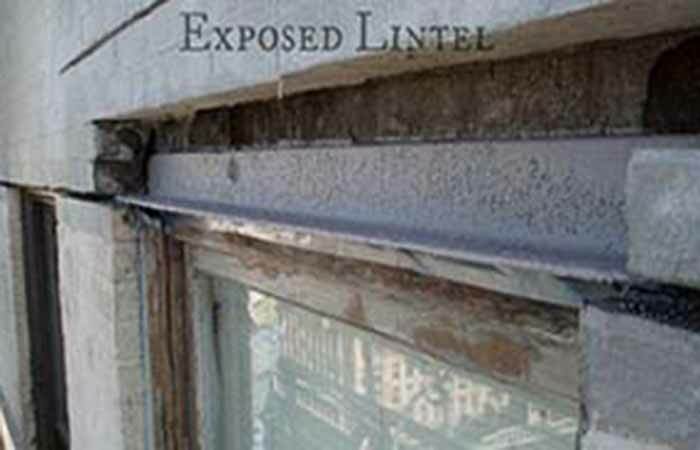 Left untreated, rust buildup on the lintels can cause them to thicken and expand up to 10 times their original size. This causes the lintels to lose strength and create added pressure against the surrounding masonry units. Careful inspection around your window and door openings for cracks in the upper corners or bricks, bowing over the windows or in severe cases, displacement of bricks and stones, can help you take proactive action against further lintel damage. Similar to other exterior maintenance issues, catching this deterioration early is key to preventing expensive building damage and wall collapses around windows and doors. Questions on repairing or preventing lintel damage? Western’s nationwide partnership of skilled workers are experts in ensuring your structure’s integrity. We will not only repair the deteriorated lintel and surrounding brick, but establish a preventative, insulated filtration system to protect your structure from future water damage. We’d love to come assess your structure damage with a free assessment. Find your local branch here for contact information.